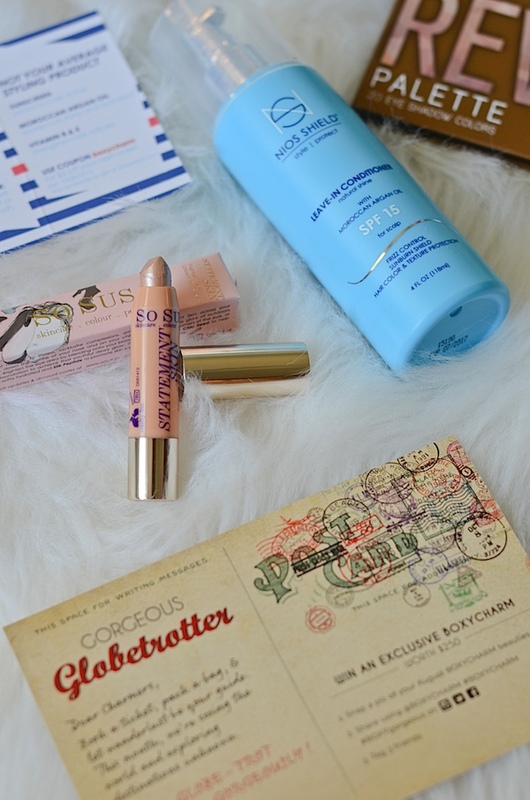 Ok, so I’m clearly catching up on lots of posts – from planners to beauty products. But some of these goodies were just too good to not share. 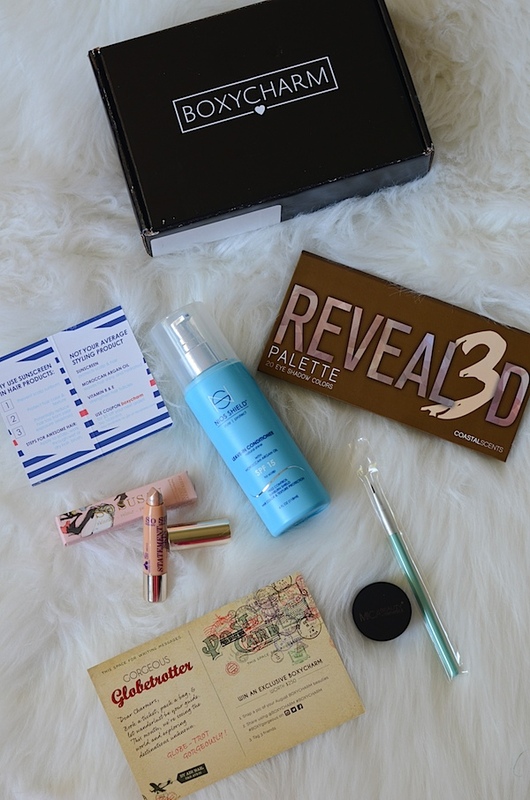 Here’s my Boxycharm August 2015 Unboxing. It’s a couple months late, but it’s given me time to think about how to do these posts going forward. While I think unboxing videos are fun sans reviews, I think I’m going to try to post these after I’ve had the chance to test out the products so I can provide some (hopefully) useful feedback. I shared the reasons I like Boxycharm in my July Unboxing post. In this post, I’m just going to cover the August box contents and what I thought about them. I’m so thankful to Boxycharm for having those lovely, detailed cards inside. They’re really so helpful. My initial thought on seeing this palette was that it looked a lot like the Naked palette in shape and style of packaging. Because of this, I couldn’t help but compare it to my Naked 2 (I don’t have 1 or 3 currently). The packaging on this one is a little lighter. It appears to be made of maybe pressed paper (?) while the Naked palette 2 is metal. It seems plenty durable, but I could see myself worrying a bit if I wanted to travel with it, especially by plane. The upside is that it’s lighter and thiner so for that reason, it may actually be better for travel. Comparing the palette colors, I noticed quite a bit of difference in pigment, especially in the lighter colors. I tested the colors by swiping the pad of my pointer finger on a color and then on the back of my hand. Then, I’d put a similar color from my Naked 2 next to it. The Naked 2 colors showed up easily with one swipe. Some of the Coast Scents light-shimmer colors needed a couple layers. Of course the color comparison isn’t one-for-one. Naked 2 is focused on neutrals while this Coast Scents palette has lots of fun color. The darker colors of the Revealed palette, especially the matte ones, had pretty solid pigment. In general, I did like the variety of colors. There were quite a few purple tones but also some nice neutrals for transitions and highlights. I’ve gotten some nice looks using them. The colors range from neutral off-white to dark gray (almost black), so you can easily do many eye looks using just this palette. They seemed to blend well together. I probably wouldn’t buy this palette again, at least not full price. Kathleen Lights mentioned in one of her videos that this palette is almost always half off. I do think it’s a pretty good deal to get all these colors for basically $20. I’ve also heard Coastal Scents sometimes does a flash sale where you can get this for $9.95! Now, that’s an amazing deal, my friends. I may not be big on make-up in general, but I do like experimenting with eye colors. So, I have a fair number of eye shadows already. And since I’m actually trying to cut down on the things I own, I don’t have a strong need for this palette. I would recommend this palette to someone just getting into make-up or someone who loves having lots of makeup. Or maybe someone who really likes purple. I waited a long time to try this eyeliner. Till October to be specific. It intimidated me. After watching some YouTube tutorials, I decided to jump in using this with the Seta Eyeliner Brush that also came in this box. I waited for a day that I had time to redo my eye makeup if I messed it up. I’ve only used gel eyeliner one time before, so I don’t have a lot to compare this to. Instead, I’ll stick to my experience with the product. I found the eyeliner fairly easy to use. It spread smoothly and evenly. It was quite strong. I accidentally got a couple extra spots on my eyelid and tried wiping them off immediately. They were stuck. This is probably a good thing because it means it holds nicely. I didn’t want to like this product because it seems a little high maintenance to apply. Maybe it gets easier with time? I did really, really like the way it looked and stayed put. It gave my eyes a really nice, refined look. I liked how strong the staying power was. I was worried I’d have a hard time removing this gel eyeliner since it seemed so strong, but my oil face wash took it right off. Phew! $35 seems really expensive for gel eye liner. I’m not sure if I’d be willing to take the plunge again on this particular product. I’d probably try out a couple other products to see if I can find another product I’m happy with. That being said, if the other products didn’t compare and I couldn’t achieve the same result (or if they weren’t as easy to use), I would buy this again. It is expensive, but a little seemed to go a long way, and I think it would last a long time. PS: If you check the MicaBeauty web site, it appears they have new packaging with a built in brush. I also read on their About Us page that their products are 100% natural, which I really appreciate. I don’t spend a lot of time in the sun, but I did take this leave-in conditioner with me on my family’s annual vacation to Kiawah Island. I thought it would be most useful for it’s SPF 15 sunscreen, though it does have other benefits. My husband happily used it on his scalp. I used this one day just along my hair part and hair line. It felt really nice and seemed to absorb fairly quickly so my hair didn’t just feel wet, but I only got it on the tips of my hair closest to my scalp. Sun protection is something I think more and more about as I get older. I could definitely see having this on hand to keep our heads protected. Most sunscreens are a bit much to apply to your head. Plus this one has added benefits for your hair, like Vitamin E, B5, and Moroccan argan oil. I’m not sure about using this every day, but I’d definitely want this with me on trips to the beach or when we’d be spending a lot of time in the open sun. According to the card, this product can also be used for color protection when applied to all the hair. I don’t color my hair currently, but I could see that being a nice benefit. I’m not sure how it would wear applied to all the hair. The product is fairly wet, so I’m wondering if your hair would just be sort of damp unless you apply it before you dry and style your hair. This would probably be okay if you’re chillin by the pool or at the beach. But I haven’t used it enough to comment on how it would work for everyday use. Has anyone tried this method? Leave a comment with your feedback. According to their site, “Not tested on animals. Does not contain phthalates, synthetic dyes, nano-particles, sulfates, parabens, or PABA.” Thumbs up on this. I do like how you can apply this crayon highlighter by So Susan without a brush. All you need is a light swipe and a little blending with your fingers. According to the card, “Powered by Organic Chia Seed to help keep skin softly hydrated and Silk Peptide to promote skin suppleness and elasticity.” This product does feel moisturizing, so this could be good if you have dry skin. At first, I wasn’t excited by the fine tips on this pencil, but a note on the side of the crayon suggested highlighting the inner corners of your eye, and I do like to do that. I tested it out, and it worked nicely, so I could see using this product for that quite a bit. The only thing about the tip is…I love the unique, chiseled tip. But, once it’s worn down and you start sharpening the crayon, I guess it will just morph into a point? I read on some reviews that this product had chunky pieces of glitter. I didn’t see that in mine. I thought it had a smooth, even shimmer look to it. It seemed like you could do a light layer for a more subtle look or go heavier for something more dramatic. I do like that this product is cruelty-free and also does not contain mineral oils, phthalates, or paragons. I’m not sure if I’d buy this product again. I think I’d need to use it more. So far, I’m glad to have it in my box, and I will continue using it. Good highlighters are a fun product to have in your makeup stash. 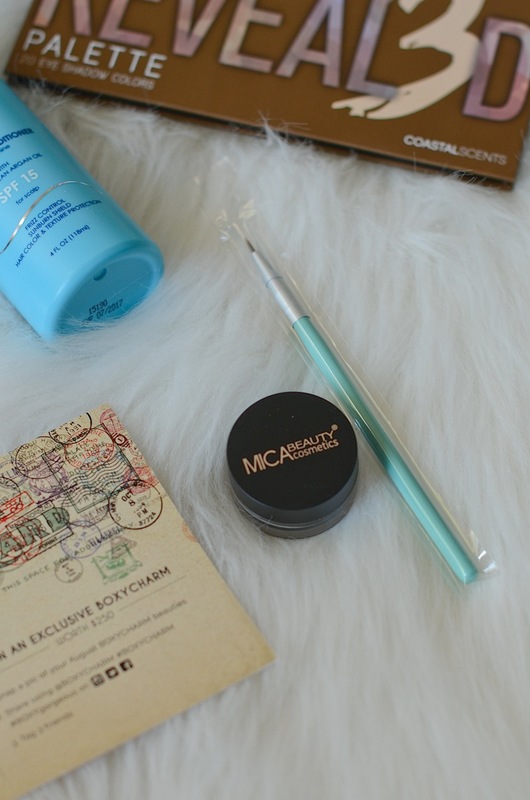 This eyeliner brush was perfect for applying the gel eyeliner that came in the August Boxycharm. I thought the length, size, and firmness were all on point. Doing a gel winged eyeliner when you don’t normally do such a thing is no easy task, but this brush made it do-able. I also absolutely loved the color of the brush handle. I mean…it’s TCL blue. And the price point seems super fair. I’m not sure I can easily pick a favorite product from this box. I really like and will use everything I got this month. Boxycharm did a really nice job this month for me. The product that fascinated me the most was the gel eyeliner. I’ll probably use the highlighter crayon the most, especially for the inner corners of my eyes. Interested in getting Boxycharm, too? If so, I’d love for you to consider using my referral link to sign up. If you do, I’ll get a little credit, which I can use to get more Boxycharm goodies. Did you get the August 2015 Boxycharm? Were there any products that didn’t work for you? Which products did you love?